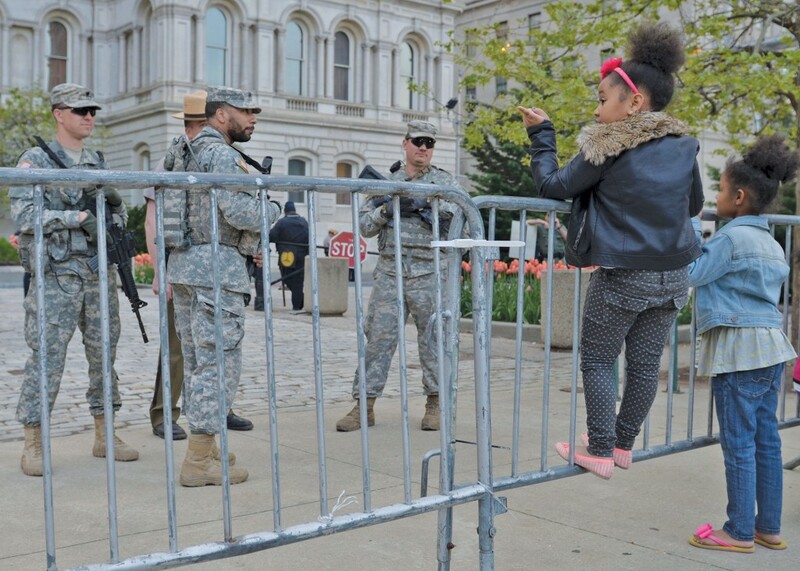 Two young girls talk to national guardsmen outside of city hall Baltimore, Md., on Friday, May 1. Most national guardsmen began exiting the city this past Monday and the curfew has been lifted. But the future of Baltimore residents remains unknown. WASHINGTON (NNPA) – Baltimore’s curfew has been lifted, the officers have been charged, and Freddie Gray has been laid to rest. But the underlying causes of the protests around his homicide remain. “I think that people need to understand the history of poverty, negligence, and police brutality in the city of Baltimore,” says Jocelyn Providence, a math teacher at Digital Harbor High School in Baltimore’s Riverside area. Last week, she said, there were more absences than usual and her students were more emotional. Many expressed fear, anger, worry, and frustration with the riots that have negatively impacted their communities. As the city turns its attention to addressing these issues and securing justice for Freddie Gray, several opportunities to support the youth and longstanding community groups have surfaced. Baltimore United, a coalition of Baltimore city community groups and concerned citizens, is keeping a list of organizations and churches serving as safe spaces for youth and activists, with free hot lunches each day and opportunities to volunteer. The list, which can be accessed on their website (www.bmoreunited.org), includes contact information for people who are directing incoming support. The coalition is also trying to raise a $100,000 bailout fund for protesters and other wrongfully imprisoned people (donations accepted online at www.crowdrise.com/legalbailsupportforbaltimore). A legal assistance and information hotline is also in operation (443-814-9160). Some of the efforts in Baltimore are spillovers from Ferguson, Mo. Operation Help or Hush, for example, began as a conversation on Twitter. Its mission, “taking social media to the streets,” is an answer to those who critique the legitimacy of “hashtag activism,” or, calling attention to injustices and relaying on-the-ground information on social media. So far, the group has served daily hot lunch to youth and protesters of all ages, and has been helping coordinate lodging, and demonstrations between Baltimore natives and visiting protesters. This week the group is going mobile, taking these lunches plus items for babies and toiletries for seniors, to social service sites around town. Items can be sent to 655 N Bentalou St., Baltimore, Md. 21216; monetary donations are accepted via its website www.operationhelporhush.org or PayPal. The funds also go toward travel for those who want to be on the front line, and to purchase protester supplies such as boards for signs, food, and water. Other efforts are focused on uplifting the youth who have been on the front lines since Freddie Gray’s homicide. “When we saw the protests start to turn somewhat negative down there in Baltimore out of people’s frustration, we knew that we had try to pull something together for the young people so that they could vent their frustrations, and tell us what some of their issues are. And so that we could provide some solutions, along with some caring adults and some local programs that they might be involved in beyond this,” says Seandra Sims, a Philadelphia-based public relations professional working to coordinate efforts in Baltimore between partners across the Northeast. The result of this coordinating is Bmore Youth Rise, a free community event that will serve as an outlet for the city’s young people. The event takes place this Saturday, and will include a youth town hall where rappers and local leaders will respond to concerns the young people present express. Earlier in the week, young residents of Gilmor Homes housing projects, where Freddie Gray lived and was arrested, will be creating a mural on one wall of a nearby recreation center; it will be publicly dedicated as part of Saturday’s events. After the town hall, there will be a peace walk to Harlem Square Park for a free hip-hop concert and rally. At the rally, Justice League NYC, a community-based criminal justice task force, will issue a call to action for support of three pieces of legislation that will address police brutality. The Justice League is an offshoot of Harry Belafonte’s organization, Gathering for Justice, and one of the event’s major sponsors. In addition to these community efforts, demonstrations are ongoing across the country – some in solidarity with Baltimore, some as part of continuing action against police violence, and others as part of the larger Black Lives Matter movement. WeTheProtesters.org and NationalStoptheKilling.com are two resources for finding opportunities around the country to get involved. Jocelyn Providence protested on three occasions last week, and says that each action was student led. In talking to her students, she expressed that they need support in making themselves heard. 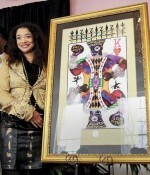 Follow Jazelle Hunt on Twitter at @JazelleAH.